iWALK 2.0 is a revolutionary hands free crutch that ends the pain and inconvenience of conventional crutches. 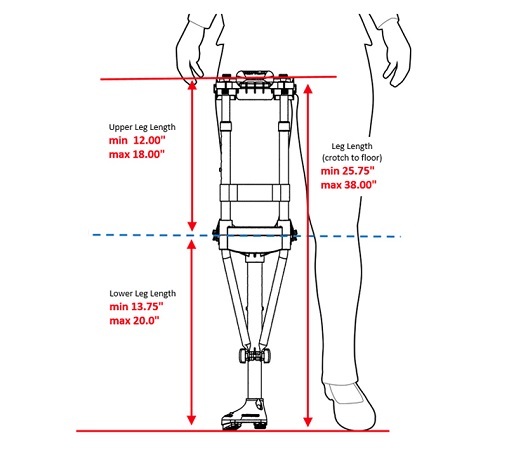 iwalk crutch allows people with lower leg non-weight bearing injuries to lead functional, hands free, pain free lives during their rehabilitation. iwalk knee crutch is safe, stable, economical and easy to learn and can change for left or right leg use and put on or take off in seconds without tools. iwalk free crutch provides self sufficiency and ends the pain and inefficiency of conventional crutches and knee scooters. iWALK 2.0 crutch is constructed of UV resistant and hypoallergenic materials. iwalk hands free crutch adjusts quickly and tool-free for user heights from 4'10" to 6'6". Upper thigh circumference maximum 28"
Note: No returns accepted related to customer complaints due to inability to adapt to the device, change of recovery plan, other use or adaptability reasons, or other satisfaction based reasons. Please read the instructions carefully before ordering. Upper leg length Min. 12"
Lower leg length Min. 13.75"
Upper thigh circumference 28" max. For any defects in materials or workmanship for One year from the date purchase, with exception of any foam padding.. If product is found to be defective, the manufacturer may repair or replace, at their discretion, any defective parts at no cost. Customer may be responsible for shipping costs of replacement parts. Warranty is limited to original purchaser for the time limit specific above and is not transferable. Manufacturer will not pay for loss of time, inconvenience, loss or damages of any nature whatsoever, howsoever caused by product, its failure to work, or any other incidental or consequential damages. Warranty does not cover defects resulting from accidents, damage while in transit, alterations, unauthorized repair, failure to follow instructions, misuse, normal wear and tear, negligence, fire, flood, and Acts of God. This warranty is the only and is in lieu of all other warranties or conditions, express or implied, statutory or otherwise, including but not limited to the implied warranties or conditions or merchantable quality or fitness for a particular purpose. Exclusion or limitations of incidental or consequential damages may not be allowed in some areas. No returns accepted related to customer complaints due to inability to adapt to the device, change of recovery plan, other use or adaptability reasons, or other satisfaction based reasons. Returns will be accepted only for any defects in manufacturing. All valid returns are subject to a 20% restocking fee. All Freight Charges, fuel surcharges, handling fees and additional freight services are non refundable.